When it comes to fruits and vegetables, vary your colors, cooking methods, and consumption for optimal nutrition. If you are concerned about preventing or controlling many of the chronic diseases such as heart disease, cancer, or diabetes, consider visiting MyPlate.gov and consume the recommended servings of fruits and vegetables recommended for your age, gender, and activity level. For example – 2 cups fruits and 3.5 cups of vegetables for active male. For additional health benefits, consider the three C’s: color, cooking, and consumption. Consuming a variety of colors can make a difference to your health. Red fruits and vegetables, such as watermelon and tomatoes, contain lycopene which is a phytochemical, or plant chemical, that can lower the risk for certain cancers, especially prostate cancer. Anthocyanin, found in red raspberries and strawberries, and also in purple produce, such as blackberries, blueberries and eggplant, is a powerful antioxidant that can also lower the risk of cancers and heart disease. Orange fruits and vegetables, such as mangoes, squash, oranges, and carrots contain plant pigments called carotenoids which can also lower risk of certain cancers, heart disease, but also eye diseases. Dark green vegetables have phytochemicals such as lutein, which can protective of eye disease, cancer, and cardiovascular disease. 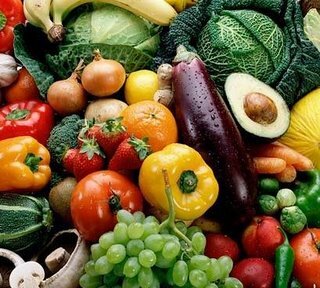 Yes, even fruits and vegetables devoid of color can be beneficial to health. Onions, garlic, and parsnips, have pigments called anthoxanthins which are thought to be helpful with blood pressure. In addition to consuming a variety of colors, consider how you consume and prepare fruits and vegetables. Many fruits and vegetables are healthiest when consumed fresh. There are exceptions however. However, the lycopene in tomatoes is more available to your body if you consume cooked tomatoes or if you consume tomatoes with a little bit of oil (try adding a little olive oil to your tomato soup!). For many vegetables, prolonged boiling can be detrimental to many phytochemicals that are heat unstable. Consider steaming or microwaving with a small amount of water to retain nutrients. Dried fruits and vegetables can add fiber to the diet, but they lose the health promoting phytochemicals during the drying process. Writer: Daniel Remley, Field Specialist, Ohio State University Extension. Reviewer: Lisa Barlage, Extension Educator, Ohio State University Extension.